Which campaigns are in the best position to win a close race of great strategic value? Which of these campaigns is in the most urgent need of financial resources? These are the underlying questions that we always ask at Blue Impact Network when determining which candidates and ballot measures that we will recommend for you to support. Blue Impact Network takes a different approach than other groups who may be focused on a specific issue or type of office. We are interested in strategic races at all levels of government – from the state legislature and statewide ballot measures, to executive offices (such as Governor) and judicial contests. In 2018, we honed in on 5 swing states – Florida, Michigan, Minnesota, Ohio, and Pennsylvania – that could also have a significant impact on the 2020 Presidential race and control of the U.S. House over the next decade because of redistricting (which happens before the 2022 election cycle). 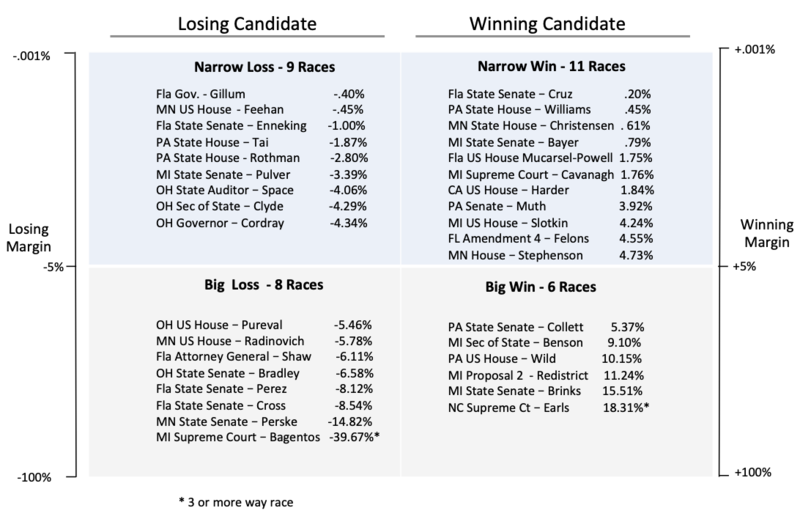 We also added a couple of “wild card” races that were exceptional opportunities – such as Anita Earls (North Carolina Supreme Court) and Josh Harder (California U.S. House). We recommended candidates at different points in the 2018 cycle…and we also REMOVED candidates from our list as circumstances and analysis changed. For example, we pulled back on recommending financial support for Democrats Gretchen Whitmer (Michigan Governor), Tim Walz (Minnesota Governor), and Tom Wolf (Pennsylvania Governor) as it became clear from polling results and on-the-ground reports that all three candidates were comfortably ahead of their Republican opponents. Whitmer won by 10 points, Walz won by more than 11 points, and Wolf cruised to a 17-point victory. We recommended a total of 34 campaigns in 2018. Half of those campaigns (17 total) ended up winning, and 20 of them were very close (within 5 points). We don’t consider races with large win margins to be successful investments, but there were a few special circumstances involved. We were pleasantly surprised by the 11-point win for Michigan Proposal 2, which will create an independent redistricting commission in the state. In our analysis, there was serious concern that the DeVos family would devote millions of dollars to defeat Proposal 2; as it turned out, that financial commitment didn’t materialize until the last month of the election and was not nearly enough to overcome a strong 18-month ground game in Michigan. Something similar happened in Florida, where Amendment 4 overcame a 60% threshold for passage as opposition to the measure never gained traction. As many as 1.4 million Floridians will now be eligible to vote; had they been eligible in 2018, those close races for Florida Senate and Governor would likely not have been close at all. We added Anita Earls and her race for a state Supreme Court seat in North Carolina much later in the cycle as we became more convinced of the great opportunity to create a fair redistricting process in the next decade. Earls’ 18% win margin is impressive, albeit a bit deceiving; this was a three-candidate race in which two Republicans split the vote. If there had been only one Republican candidate on the ballot against Earls, she might have lost by a margin of 1-2 points. On the losing side, 10 of the 17 defeats (among our recommended campaigns) took place in Florida and Ohio. Both states underperformed compared to pre-election data and polling, though our Florida experts did pick the ONLY State Senate seat that flipped from Red to Blue (Janet Cruz). In Ohio, polling data consistently showed a neck-and-neck race for Governor; Democrat Richard Cordray ended up losing by 4 points, which was a drag on the rest of the ticket. Overall, we think the Blue Impact Scorecard is a robust and fair way to evaluate campaign investments relative to a more traditional win/loss ratio. ‍In the coming weeks, we’ll look at scorecards from other campaign-focused organizations and groups as a comparison – sort of like a “Consumer Reports” for political investing. We are also working on rolling out what we’re calling the Relative Investment Value Index (RIVI) for political investing. For example, a campaign that spends $100,000 and wins by 1% will have a higher “RIVI” than a campaign that spent $1 million and won by 1%. Money isn’t everything in politics, but it will always be a critical component of a successful campaign; it is our belief that “RIVI” can become a powerful tool for analyzing political investments in the future. Look for us to roll out our “RIVI” explanation after final campaign finance reports from 2018 are made publicly available. As they say, the 2020 election cycle officially began the moment polls closed on November 6. We're already looking ahead to states where political investments could have an outsized impact on numerous levels. We’ll also be recommending high-leverage investments for critical 2019 races (Virginia, we’re looking at you). Thank you for everything that you did in 2018 to move us closer to a more reasonable and sane government. We’re going to need your help again in the coming months and years. Are you a fan of Blue Impact Network? CLICK HERE to contribute to our organization as we look ahead to the next election cycle.